Are you a conspiracy theorist? Or a coincidence theorist? Our world is a mess – but is it by intentional design, or random happenstance? We all know our world has gone mad, and many of us shake our heads wondering how we got here. Ineffective government, endless resource wars, failing economic and education systems, planetary degradation; very little about our current global circumstances reflects our hopes and dreams and goals; our shared wants for peace, for justice, for technological progress that supports not destroys our planet. It does not reflect our innermost nature, which yearns for peace and abundance. And yet, no matter what we do, no matter who we vote for or what they promise to do, or how many of us also feel humanity is on a slippery slope to its own demise, for some reason, we (collectively) keep marching boldly on in the wrong direction. Strangely, many even go as far as questioning the sanity of those who believe all this is not by accident but by design, and dismiss “conspiracy theorists” as lunatics and uncritical thinkers. 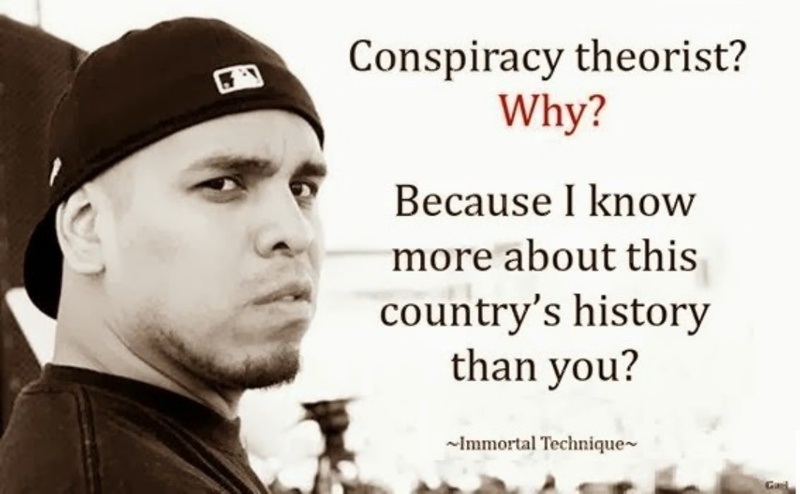 If that sounds like you – if you’ve used the phrase “conspiracy theorist” as a derogatory term – open your mind and consider what I’m about to say, if only for the 3 minutes as it takes to read it. definition: a secret plan by a group to do something unlawful or harmful. synonyms: plot, scheme, plan, deception, collusion. b. To employ propaganda assets to and refute the attacks of the critics. Book reviews and feature articles are particularly appropriate for this purpose… Our ploy should point out… that the critics are (I) wedded to theories adopted before the evidence was in, (II) politically interested, (III) financially interested, (IV) hasty and inaccurate in their research, or (V) infatuated with their own theories. Shortly after, articles posted in the New York Times and Time Magazine repeated the phrase “conspiracy theorist” numerous times in a disparaging context, just as the CIA dispatch had recommended, and it has since become widely associated with superstition and paranoia through its ongoing depiction in the mainstream media. Linguistically, the phrase also associates any mention of conspiracy with “theory”, not fact. It was a fine piece of propaganda. 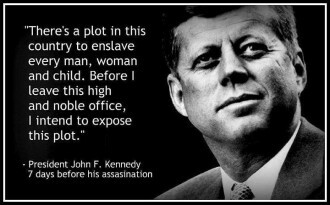 Was JFK a paranoid “conspiracy theorist”? Today, conspiracy theorists look at the many recent examples of government corruption and cronyism (eg. the TPP, the privatized Federal Reserve), false flag attacks (eg. 9/11) and endless wars, the media’s censorship of important stories (eg. Fukushima), unprecedented government surveillance and regulation (of its own people! ), rigged economic systems (eg. fractional reserve banking), rigged elections (eg. USA 2004), a failed education system (eg. Common Core Conformity), cultural disconnection, and an unsustainable relationship with our environment, and they see a common thread — a conspiracy — that binds these narratives together. Sure, it sure takes a stretch of our comprehension to understand the dark and complex scope of the collusion required to subvert our democratic governments and install a ‘shadow’ power over our societies. The concept of a global conspiracy of ‘elite’ powermongers is a difficult one for ALL of us to get our heads around, once the penny finally drops, and is one that even the most ardent conspiracy theorists have personally struggled before openly deciding to put the “tin foil hat” on in public – a public that thinks the very notion of a global conspiracy is nuts. But let’s be realistic — power corrupts. That is the human nature we are confronted with today – not yours and mine, but the nature of those in power. And, given that nature, it is an even greater stretch of logic and reason to believe that those powerful few at the very top of our political social and economic oligarchy (the Rothschilds, the Rockefellers, the Crown, the Vatican, the owners of Mass Media, etc.) who collectively hold both the means and motive to assume unwarranted and unprecedented global control, have NOT – from either benevolence or blindness. And yet, that is what coincidence theorists believe – that the most powerful political, economic, religious and media institutions on the planet have chosen not exert their fullest influence on our societies nor extract the fullest personal gain that their positions inarguably offer them. Rather, they would have us believe our world is shaped by a random (yet decades-long) sequence of the worst possible mistakes and injustices humanity could ever make for itself and its future, which coincidentally continues to funnel power, wealth, influence and benefit into the hands of the most powerful. And even worse, that it’s all our own fault, because that’s our “nature”. Sorry coincidence theorists, but now it is you who are being foolish. I can tell you from experience, as someone who (like you) also used to believe the notion of a global conspiracy was the realm of the paranoid and delusional — if you flex the critical discernment muscles you so often proclaim, suspend your preconceptions and fears, and research beyond the surface of the mainstream narrative, you will be surprised – as well as horrified, indignant, angry and maybe a little frightened. But please, it’s time to stop smugly dismissing ‘conspiracy theories’ blindly and without intelligent consideration, just as the loaded CIA-created phrase encourages you to do. Truth is stranger than fiction. And until you’ve really researched and considered the detail not just of individual “conspiracy theories” but the sum total of their interplay, your opinion is worthless; and it is contributing to the problem. In truth, corruption, destruction, manipulation, selfishness, short-sightedness – they are not my nature. Are they yours? Personally, I am outraged by what I see happening in the world, and from where I sit, so are most of you. I wish a far better future for my children and grandchildren than we are currently creating for them – and if I understand the true nature of human beings, so do you. So how then, can our current course of direction be the collective total of our nature? The reality is, it can’t. Our ship is being steered in the wrong direction because it suits those at the helm, not those who are busy paddling and simply trying to stay dry. And no matter which way voters choose, we keep sailing in the wrong direction. That is no accident; it is by design. Modern politics, economics, education, agriculture, allopathic medicine, information media, energy, technological dependence, non-local food supply, even the way our society interacts with itself (competitively instead of cooperatively); all are new to the modern era. All are altered versions of effective and sustainable models that our ancestors thrived on for millennia, and all became unsustainable – but increasingly profitable and beneficial to powerful families, institutions and the status quo they prefer – in the past hundred or so years. In complete contradiction, coincidence theorists would have us believe it is human nature en masse to be greedy, opportunistic, destructive, warring, manipulative and competitive. And yet, when it comes to believing that only the few most powerful people possess and actively use these qualities to their own benefit — to manipulate the collective mind and consolidate their power — all logic fails. They consider it impossible that a group of humans could be so twisted as to collude in such a way that leads humanity collectively down a garden path, but somehow, they deem it more possible that we could ALL be wired that way – and that the problems we see are all a mysterious coincidence. But we are not wired that way, only psychopaths are. Our acceptance of this psychotic behaviour (see Zen’s article on Psychopathy) is not part of our nature – it is part of our socialization and conditioning. Not coincidentally, this conditioning is determined and administered by the governments, media and institutions that benefit from the state of affairs our conditioning has led us to accept. As a result, we sit idly by as corporations are given the rights of persons while human rights are increasingly undermined; while the hellish violence of (highly profitable) war is promoted by our ‘leaders’ as the only way to achieve peace; while our children are taught to become “adults”, to suppress their instincts and adapt to a society that is not like them – one that expects them to be selfish, destructive and unkind as par for the course – all the while forgetting that our nature should determine the shape of our society, not the other way around. That we are so far off course with little sign of change; that we have not only come to accept this insanity as “human nature” (but, of course, not our own); that many even defend the status quo as “the only way” for humanity; this is no coincidence. It is by design. Call it what you will – conspiracy, collusion, complicity – we are here because the most powerful people on our planet have acquired both the means and the motive to assume beneficial, underhanded control of the most influential institutions in our society. And they took it. Now it’s time we take it back. If by now you’re still advocating the coincidence theory, in all its improbability and implausibility, I have an old a tin foil hat you can borrow. To our readers who say, “Wake Up World, just stick to the natural health, and spirituality. Why do you have to post this conspiracy stuff?” … Because, friends, it’s all part of the same story. The reason ancient esoteric wisdom and ancient spiritual practices have not been passed down to you organically… The reason centuries-old food-based health remedies are not passed down through families and communities, but are considered “alternative” or “fringe” therapies, while symptom (not cause) based pharmaceutical medicine (which kills hundreds of thousands of people each year) is considered the norm… The reason our environment has been trashed since the industrial revolution, which has driven ownership of business into fewer and fewer hands… The reason governments continue to (unlawfully) ban the simple act of growing your own fruit and vegetables… The reason technology and resources are spent on dangerous energy systems like oil and nuclear, while non-toxic and renewable energy technologies are routinely suppressed… The reason journalists announced that Building 7 had collapsed half an hour before it actually happened… The reason the last US President who spoke out about high-level conspiracy (the government behind the government) was assassinated shortly after… The reason for all of it is the same. War, sickness, religion, debt creation, media, fossil fuels, food production — these are the most profitable and powerful industries in the world. It is naive to believe their stranglehold on our society is by coincidence not by design, and there is little point in working to remedy the symptom, by sharing health information or spiritual knowledge, without also addressing the cause that brought us here – the collaboration between the world’s most powerful people, for their own mutual benefit.